Nice Appearance - All themed to be gold and Red/black, looks high class. 10 digits display, large numbers and the elevated top makes it easy to see the numbers. Sleek outside, big and sensitive keys for standard calculation , perfect for office, primary school, market or home use. 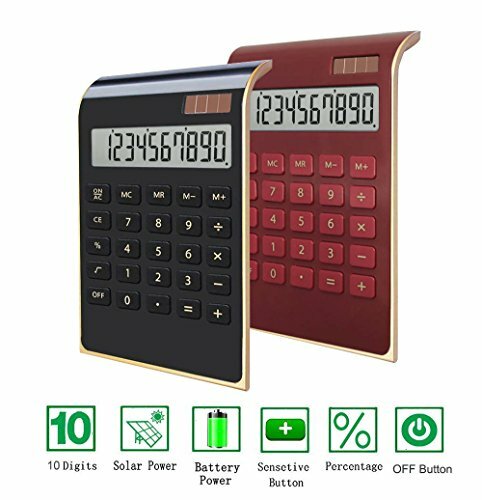 Dual Power Calculator - Solar power(works only with bright light) and battery power (1 cell button inside the calculator). Note: There is a built-in cell battery in each calculator that will lasts for several months. When the battery is exhausted, please replace a new battery for continuous and accurate usage. Because some buyers may use it in the early morning or in the evening, and the screen maybe difficult to read in low light. If you have any question about our product, feel free to contact us,and we will reply within 24 hours.New Product Promotion.Enter code E5WLC8IN, and enjoy 25% discount. If you have any questions about this product by BESTWYA, contact us by completing and submitting the form below. If you are looking for a specif part number, please include it with your message. Sharp EL-310WB Mini Desktop Calculator, 8 Digit Angled Display, White, 3.38" x 4.75" x 1.0"